Believe it or not, alongside the canals, ponds, cafes, tennis courts and sports grounds, there are actually deer in Victoria Park, for the moment at least. For now, they live in a little pen near the model boating lake in East London's best park, in a little pen where you can peer in on them. Sure, they're not the happiest looking deer. They look slightly annoyed and they're certainly not much like those head-held-high herds of snooty Richmond Park deer. They're more like the ones who live beside Alexandra Palace. Rather pissed off looking. They're still nice though. 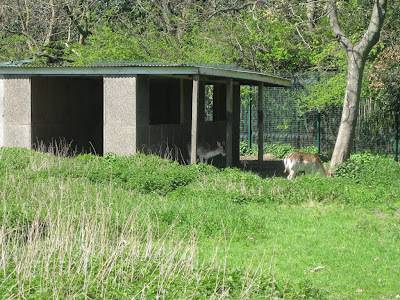 Probably for the best, however, that the new Victoria Park 'Masterplan' has decided that the existing small herd of three female deer will probably be relocated to a larger herd away from Victoria Park, and the deer shelter demolished to return the site to an informal meadow. Still sad, though. Your author likes the deer. I'm glad the deer are being relocated. A park is no place for these timid, wild animals. The standard of welfare in Clissold Park in Hackney is a disgrace. This park has received lottery funding and the deer are living in appaling conditions. They are confined to an area far too small for their needs and without adequate foliage and cover to protect them from barking dogs and the huge demolition and building work around them. Today, a fawn was born surrounded by massive machinery, noise and vibration. What a cruel replacement for the green wood and forest which is its natural home. Clissold Park has had poor animal welfare standards for a long time. Deer and swans have been attacked by intruders over the years. Um, this article is about the deer in Victoria Park, not Clissold Park.